I’ve been battling pneumonia the past few days and unable to enjoy any wine. [Thankfully I had a queue of reviews that had been ready to go.] 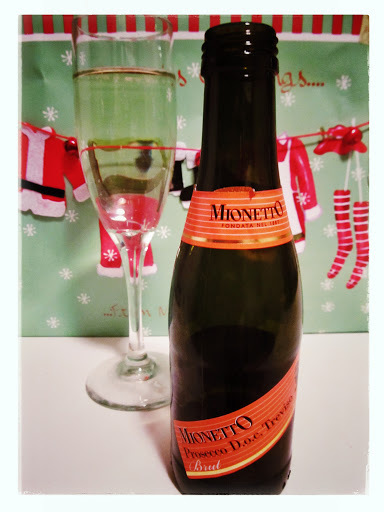 Christmas Eve found me on the road to recovery and fancying a light, bubbly sip so I popped open the mini bottle of Mionetto Prosecco Brut NV that I’ve had chilling in the fridge for an occasion I can no longer remember. The Mionetto family of wines has been producing Prosecco since 1887; today it is the most popular brand of Prosecco in the US. Last year Wine Enthusiast bestowed Mionetto with the “2011 Importer of the Year” Award. Pale straw in colour, the aroma of fresh apples rose from the glass. Clean flavours of apple pear and citrus blossom abounded in the light, fizzy body. Almond and traces of honeysuckle comprised the crisp finish. Very dry, light and crisp, this is a festive bubbly on its own, yet also perfect for fun additions such as Chambord, Disaronno, or any type of liqueur.